Iris is just three months old and has a condition called Cerebellar Hypoplasia (CH). CH occurs when parts of the cerebellum are not completely developed and can be related to genetic causes, or due to other factors like infections, toxins or nutritional deficiencies. This condition is ill informed to people and these kittens are often euthanized for being sick. Iris came from Anderson County Shelter in South Carolina. The coordinator of Rescue Transport USA, Robyn, was informed by a friend of Iris. Robyn has five cats with CH, just like Iris. With experience and understanding the condition very well, Robyn received Iris’s adoption link and immediately applied. 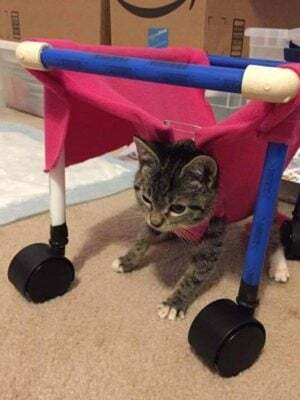 Since these kittens need assistance special modifications are needed to keep them safe. This includes an enclosed litter box with walls, deep set food bowls and needs her head to be held while drinking water. Iris stays in an enclosed area that is padded. Thanks to Rescue Transport USA, Iris was transported from Anderson, South Carolina to Melbourne, Florida where she has brothers and sisters just like her at her furever home. Volunteers and organizations can sign up for free to rescue more animals at Doobert.com.